Sold Out! Sorry... no wait list. 12 miles of technical, singletrack trail on an out-and-back course with over 3,500 ft. elevation gain, following the ridgecrest of the Holyoke Range. It’s widely considered the most challenging trail race in the Northeast… and in our humble opinion… it has the most beautiful views. There are steep hills, with sharp rocks and plenty of roots and then, when you least expect it, a ledge pops up that you need to jump off. There will be walking. It was an amazing day, full of feats of strength, delicious food, and a grass-rootsy trail running community. The ridgeline is like a rollercoaster, but not one of those smooth modern rollercoasters. It's more like an old wooden rollercoaster that keeps you alternating between euphoria and nausea. We’re a grassroots event full of local people just trying to make the race a special day. Whether you’re here for the run or here for the fun, there are lots of ways to help. Runners are required to carry their own hydration, but we’ll still be filling them up at two manned water stations. Want to help keep them hydrated? Every year over 500 runners register and they all have to pick up their race bibs. Help staff the registration table and wish them all, “Good luck!” They’re gonna need it. At the halfway turnaround, they’ll be wondering how they’re going to make it back. Help them out by sharing some race fuel, food, and high fives. At the end of a 12-mile trail race, these runners aren’t going to be looking so fresh when they come sprinting toward the finish. Be at the finish to help them. If you’re a trail runner, get ready, it’s gonna be fun! If you’re a road runner… um… you’ll probably do okay… just try not to fall. 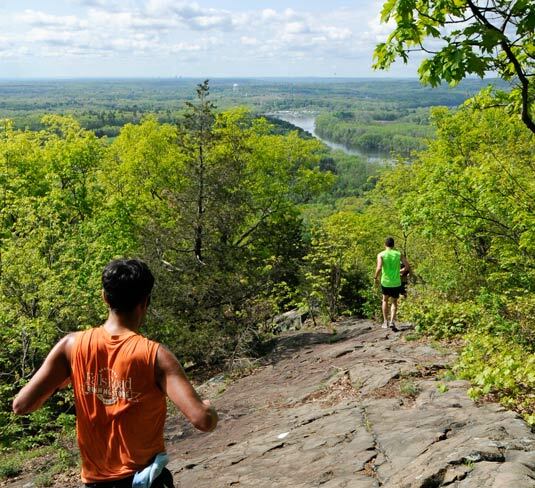 A 12-mile trail race over the scenic (and epic) Holyoke Range along the M-M trail in Amherst, MA.